I am a bass nut, so several years ago, I decided to go after a Suwannee bass record. Looking through the "Official World Fresh Water Angling Records" booklet, I noted that most of the Suwannee bass line classes were vacant without a single qualifying fish. The fish is endemic to the north central part of Florida, near where I lived at the time, so I was somewhat familiar with tactics to catch the Suwannee bass. Careful planning was all that was needed. The booklet also reveals information on how to establish a record catch. Line class divisions for each species were outlined and vary according to the maximum size of a particular species. For example, more divisions are set up for the flathead catfish than for a bluegill. Since the line classes for the Suwannee bass were open, I spooled five different reels with eligible line weights in two-pound increments from 6 to 14 pound test. The same type of monofilament was used for consistency of breaking strength. The rare bass does not grow much larger than a couple of pounds, and the all-tackle record at the time was only 3 1/2 pounds, smaller than the bluegill, crappie and redear sunfish all-tackle records. I had caught specimens of the bass up to almost two pounds, so I was optimistic about establishing a record. On my first record-hunting trip to the Suwannee watershed, a friend and I had about five hours of fishing. We selected crankbaits that were painted to resemble crayfish, the little bass' predominate forage. We chose to fish the lower 30-mile stretch of the Santa Fe River that joins the Suwannee just south of Branford, Florida. Shoals of exposed irregular limestone are common on the Santa Fe, and those areas are where the Suwannee bass congregate. Elsewhere along the river, largemouth frequent lily pads, fallen trees and mud banks off the current. The river is influenced by several springs, including the Ichetucknee River, a crystal-clear run popular among snorkelers and inner tube drifters. The Santa Fe, though, is tannic-stained over most of its 70-mile length. I launched my boat about 7 a.m. that morning, and my partner and I began casting the crankbaits around all limestone outcropping. We caught and released two largemouth bass before fooling a small Suwannee bass that would not make one pound. The rocky shoals took their toll on our lures. With a strong current pushing us along, hang-ups were all too frequent. My friend was the first to connect with a record fish. The 1 1/2 pound Suwannee grabbed the crankbait and was soon resting in my live well. Fifteen minutes later, my crayfish imitation hooked another Suwannee, this one later weighing 1.3 pounds. Both fish were taken to the local grocery store and weighed on certified scales. Record forms were filled out, according to the instructions, and the line sample and applications mailed to the Hall the next day. About four weeks later, we were notified of our fishes' acceptance in the record books. Mine was short-lived, but my friend's mark lasted almost two years before it was broken. I took another friend about three months after setting those records, and she set a line -class mark for the Suwannee bass with another that weighed 1-pound, 4-ounces. All three fish were caught on different weights of line. Knowing which outfit has which line strength is vital to setting a record, as I learned during a later trip to the Suwannee River. I had launched my boat at Branford and was making a few casts near the ramp while waiting for a photographer from National Geographic Traveler to join me for an exploratory/photo trip on the river. My fifth cast with a crayfish-colored crankbait was jolted by a Suwannee bass. I carefully fought the fish to the boat on my 12-pound test line and quickly realized it was my largest Suwannee ever. I emptied out my cooler, filled it with river water and the fish and I headed for the local grocery, about a block away. I had my record application along and got the signatures and certified weight needed for submitting it to the Hall. The 2-pound, 10-ounce Suwannee bass was a monster. There was only one problem when I got back home with the fish and application. I checked the Official Records booklet and found that the all-tackle record was caught on 12-pound test. My fish would not qualify in that line class. My mistake in using 12-pound test that day was a major one. That fish would have netted me another record in any other line category! The Suwannee River lies in what I call the "Limestone Spring Belt." Vast deposits of limestone exist on land areas that were once covered by the ocean. In this region of northern Florida and southern Georgia, deposits are very near the surface and both springs and sinkholes are numerous in many locations. Many springs are sources of large, navigable rivers, with mouths often 100 feet across. Thousands of lesser springs and sinkholes are also found in most of the river systems. The "belt" is bounded on the north by Valdosta and Waycross, Georgia, and on the east by the St. Johns River. The range extends westward through the panhandle and south almost to Orlando. The territory includes several watersheds where the fishing can be exciting. More than 20 Florida springs in the "belt" area discharge at least 65 million gallons of water daily. The springs erupt from ground water through the lime deposits. As limestone is washed away, cavities are formed through the soil, resulting in the development of runs and sinkholes. Most spring runs in the region contain largemouth bass of up to 12 pounds, and many other springs yield particularly impressive specimens as well. The largemouth record for each of the Homosassa and the Withlacoochee rivers exceeds 18 pounds. 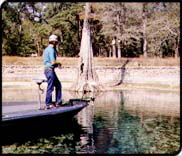 Bass weighing 15 pounds have been caught from the Oklawaha, Crystal, Apalachicola, Econfina and Hillsborough Rivers in this limestone spring 'bass belt.' These rivers are well known for their fishing opportunities, but they are just a few of the many waterways spawned from the spring/sinkhole network in Florida's limestone base. The Okeefenokee Swamp, just north of the Florida line, is the headwaters for the Suwannee and St. Mary's Rivers. The scenic 630-square-mile tangle of vegetation and twisting tributaries provides excellent angling for medium-size bass in its numerous 'deep holes.' The bass fishing here, like on so many of the spring -influenced waters, is generally neglected. From the small town of Fargo, GA, the Suwannee River stretches south for 100 miles. Twisting, quiet swamp water changing occasionally to white-water shoals above the Florida town of Branford makes its personality and bass fishing opportunities interesting. Its lower reaches are placid and picturesque with many limestone springs lying back from its banks. Excellent bass angling exists from the Gulf northward, and while spring water areas are incredibly clear, the better fishing is found in the tannic acid stained water. The Santa Fe River joins the Suwannee 10 miles below Branford and is navigable for seven or eight miles upstream. Above that, travel is dependent on high water, as rapids and shoals are numerous. The beautiful Santa Fe River offers excellent angling for largemouth and for the tough-fighting Suwannee bass. Another well-known tributary is the small, undeveloped Withlacoochee River that flows from Quitman, Georgia to its junction with the Suwannee near Live Oak, Florida. This spring-influenced river has good largemouth and Suwannee bass fishing. A second river of the same name is the very scenic and popular waterway in Central Florida's Citrus and Hernando Counties. The Withlacoochee River there has over 80 miles of meandering bass trails through sand hills harboring dense hardwood swamps. Due to the number of false channels in the lower end, a good topo map or guide is necessary to avoid confusion. Noted for its big bass, the beautiful Oklawaha River is navigable from several miles south of Ocala northward to its confluence with the St. Johns River. Bass fishing is excellent in the river, both above and below the renowned Rodman Reservoir. Near Ocala, the Silver River and, for sheer boating pleasure (no fishing allowed) Silver Springs are hard to beat. The narrow clear stream has an impenetrable jungle on both banks, including monkeys, descendants of those appearing in old Tarzan movies. Silver Glen Run, on the eastern edge of the Ocala National Forest, pours out 72 million gallons of 72-degree water daily. Big bass, particularly during spring spawning season, frequent the 1/2-mile long Lake George tributary. The nine-mile wilderness trip down Juniper Run, or a five and one-half mile float down Salt Springs run, both ending at Lake George, offer similarly unique opportunities for largemouth bass of huge proportions. The striped bass also love the stable temperature waters provided by the St. Johns' spring runs . North of St. Petersburg, off U.S. 19, the historic Homosassa River is a great area in which to drift down a lazy river and catch some bass. Several resorts and boat ramps are along the banks from near the Homosassa Springs tourist attraction, all the way to the Gulf. This enchanting and beautiful body of water provides excellent largemouth fishing near the springs and great angling in the lower portion for salt-water species. Winding its way down from Lake Seminole to the Gulf just west of Tallahassee is the bassy Apalachicola River. Largemouth and striped bass often occupy large portions of the river during the year. Fishing is best during low water, except near the Gulf where high water is great for brackish water bass fishing. The Chipola River, which feeds the Apalachicola, offers shallow and crystal clear waters flowing over a limestone bed. While it is enjoyable to drift and cast for the rare Coosa bass, the water clarity makes angling difficult. One of the very best fishing spots in the area is Crystal River. The clear, spring-fed river usually produces the best fishing for small largemouth bass in the fall each year. Scuba diving and canoeing are other sports that are participated in extensively on this river and on the Ichetucknee near Branford. The beautiful six miles of the Ichetucknee provides thousands of weekend tube-floaters an opportunity to spend several hours drifting by unspoiled wilderness. The lower three miles offers angling for the numerous, but very 'wary', largemouth and Suwannee bass. West of Tallahassee, the Ochlocknee River, although not crystal clear, is fertile and the bass can grow large. The river runs through Lake Talquin on its way to the Gulf. Stripers are attracted to the spillway below the dam in the first few cold months of the year. The picturesque Wekiva River, about 20 miles north of Orlando, flows through semi-wild subtropical country and is renown for its canoeing trail. The 16-mile-long waterway does abound in bass and is often overlooked by anglers. Small craft will find the 'jungle' cruise for largemouth very interesting. Other spring-influenced rivers with excellent bass angling exist in the 'belt.' In the panhandle region, the Econfina, Wakulla, St. Marks and Aucilla Rivers are noteworthy fishing streams. Others further south and east include the Alapaha, Rainbow, Chassahowitzka and Hillsborough. These and other spring-influenced tributaries often provide excellent bass angling. Spring runs in the limestone region of Florida and Georgia offer unique experiences and lots of bass to those in the know. Newcomers, however, can often find a boat with a chipped or scratched hull and simply follow it!